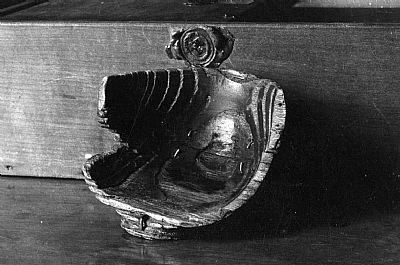 The Holy Grail a small fragmented vessel also known as the Nanteos Cup or Cwpan Nanteos, said to be The Holy Grail used by Jesus Christ in the last supper. Itis believed to have come to Nanteos with seven monks from Strata Florida, Cardiganshire, on the dissolution of the Abbey in the reign of Henry VIII. 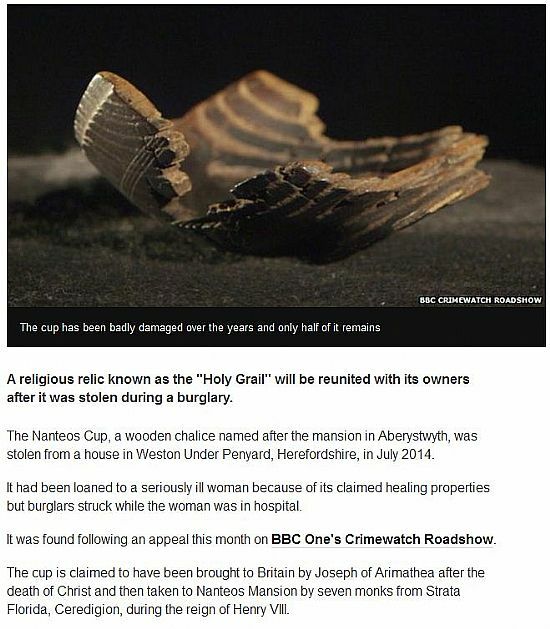 The abbey disbanded in 1539 and it said that seven monks escaped from the Strata Florida Abbey together with the Cup and fled to Nanteos, where they stayed. When the last monk passed away and Cup was left in possession of the Joneses of Nanteos. The sacred vessel was kept safe for many centuries at Nanteos. It is said that the monks are buried near the two beech tree in front of the mansion that stand majestically today. Through marriage the Powell family took over the Nanteos estate in 1699. 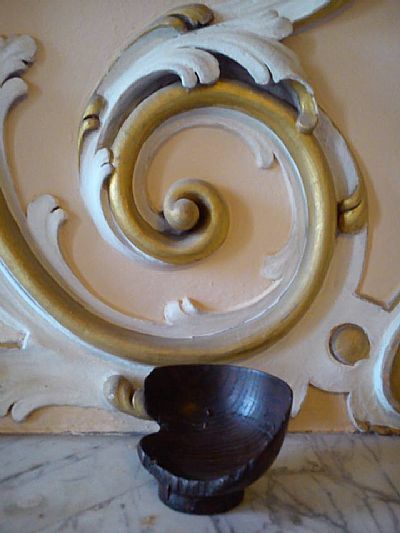 The history of this Cup begins to evolve into a Healing Cup where people were cured of their ills by drinking from it. However, it is many years later it makes a first public appearance. 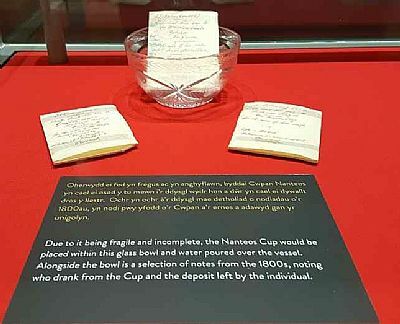 The Nanteos Cup was put it on display at the college of St. David’s University of Wales, Lampeter by George Powell where it was displayed in a ‘Cambrian Archaeological Society ‘exhibition in 1878. From the onset of its first public display, word of its power as a Healing Cup began to spread; it was displayed quite regularly in various local meetings and lecturers etc. The Cup was kept in the library at Nanteos, locked in a cupboard. The Cup that was on display was a replica made by Richard Rees Jones of Rhoserchan, Isaf, Capel Seion. The visitor that wanted to drink from the Cup would be sent into the Morning room to be greeted by Margaret Powell. 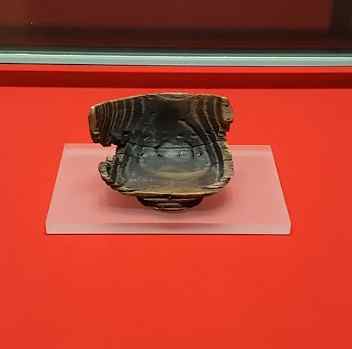 Maggie the Housekeeper would be in the Library placing the genuine Cup on display instead of the replica and was put on display on the table between the two windows. She would fill it up with water, and then Mrs. Powell would enter the library from the morning room with the visitor. The visitor then drank from the Cup. After the water was drank Mrs. Powell took them into the dining room and slammed the door loudly so Maggie could hear. Maggie said that once she heard the door slam she would then take the Cup, dry it and then replace it with a replica in case anyone tried to steal it, and replace the real Cup in the locked cupboard. She said that this was done every time when a visitor called. Today, a new chapter begin with the Nanteos Cup. The Cup returns to the National Library of Wales for safe keeping. The Cup now measures only 10cm by 8.5cm, is held together by wire staples and fits comfortably in the palm of the hand.